Perfect for adding colour to hanging baskets and seasonal bedding displays, they will need to be kept in frost-free conditions and overwintered under glass. From early spring, the tubers can be potted up individually, with the indented side uppermost, gently pushing them into the surface of a good quality potting mix. When planting up hanging baskets, allow 3 tubers for each 12” basket. Immediately after potting, water well and then grow them on in bright, frost-free conditions, watering only when the compost gets quite dry. Move them outside after all risk of frost has passed and while they are actively growing, water more frequently and feed them with a balanced liquid fertiliser. White flowers always makes a statement and they are particularly useful for lightening up shadier spots. This new trailing begonia is perfect then as it has really large flowers that won't go unnoticed, and it is very happy in lower-light positions.Grows to 20cm high. Larger than average camellia-like flowers seem to drip from the lax stems putting on an impressive display for months on end from midsummer. A must for hanging baskets, patio pots and windowboxes.Grows to 20cm high. Super-sized flowers put on a great display as they spill over the edges of pots or windowboxes. This is a great choice if you have hanging baskets in a shadier spot, as they will still carry on flowering, and do not need as much water as many of the other seasonal bedding plants.Grows to 20cm high. Garden care:Pot up in early spring when the growth can be seen emerging from the tubers. Begonias are tender so must be protected by frosts, however you can pot them up and grow them on under glass from January onwards. The indented side of the tuber is the top, and this should just be covered by a fine layer of compost. Water well and keep them in a bright, warm spot, watering again only when the soil becomes quite dry. Once they are actively growing they can be watered more regularly, especially those growing in sunnier positions, but make sure that the compost or soil is never overly wet or waterlogged. During the growing season they can be fed with a balanced liquid fertiliser. 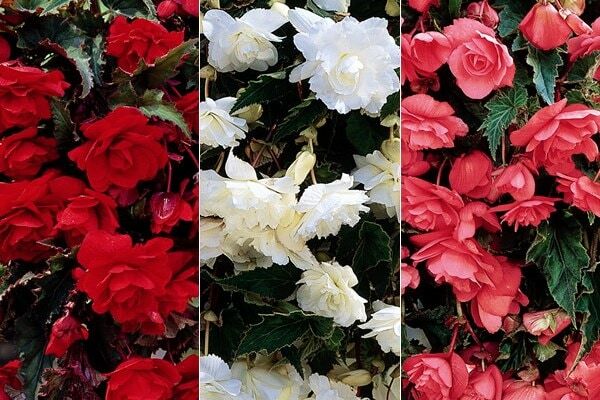 Begonias grown in the ground should be lifted before the first hard frosts and left to die back before being stored in a well ventilated, dry place over the winter. Container-grown plants should be brought under cover during winter and 'potted on' into a slightly larger container each year in spring.